New and precision rebuilt clutch components to restore your pride and joy. While the rest of the industry has relegated many these classic marques to obsolescence, Australian Clutch Services have expanded their Classic Clutch range to the point where in 2009, we decided these pieces of history deserved their own banner. Launched in 2009, Classic Clutch is Australasia's only location where you will not only be able to source complete clutch assemblies for classic marques such as Ferrari, Lamborghini, Alfa, Maserati, MG, Lotus, Triumph, Leyland, Aston Martin, and Jaguar as 'off-the-shelf' items, but you will also find personnel with the expertise and experience to be able to rebuild and reset your original clutch components that are simply no longer available. Also available are original equipment replacement and high performance alternatives for your classic muscle car. We cater for Chevrolet, Buick, Dodge, Ford, Chrysler, among many others. 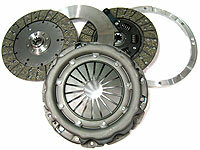 If it's not in our catalogue, Classic Clutch can still make or rebuild and upgrade a clutch to suit your needs. Check out our product catalogue to see what we can offer or make an enquiry to see how we can help.